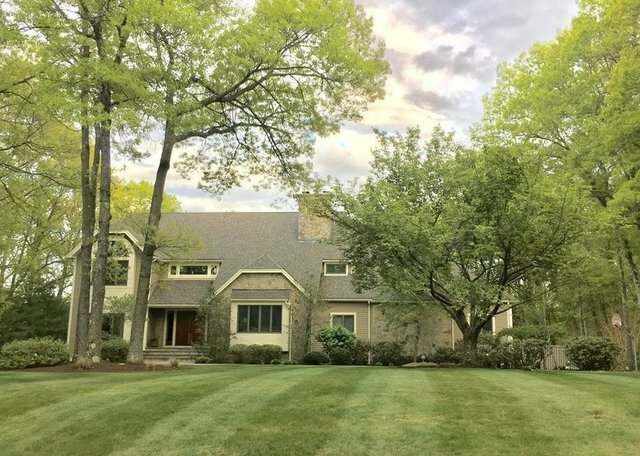 Exquisite custom contemporary colonial situated on just under 1 acre of lush manicured property in most desirable Sharon neighborhood showcases superior craftsmanship while offering the utmost in privacy. The iconic living space is beautifully proportioned to live the ultimate luxury lifestyle. 1st level boasts a professional Chef's kitchen w/stainless appliances, induction cook-top, built in fridge, wine chiller, granite & quartz countertops & center island w/seating for 4. Double sided fireplace in kitchen & dining room makes for elegant entertaining. Gracious living room, fireplaced family room, sun room & library/office/guest room complete this level. Sophistication abounds in the spacious fireplaced master suite with spa-like bath and enormous walk-in closet/dressing room. Three additional bedrooms include 1 with large loft & two w/balcony overlooking the in-ground pool, cabana and pond. Come & experience residential perfection in this one owner meticulously maintained home.